Let me clarify, BFF’s here means Best Friends Fortified. You see, I turned 40 two weeks ago. My best friend, Rissa, also turned forty earlier this year, but we still haven’t celebrated her 40th birthday. So we decided to go to Kyoto to celebrate this milestone for both of us. Or maybe Kyoto chose us. 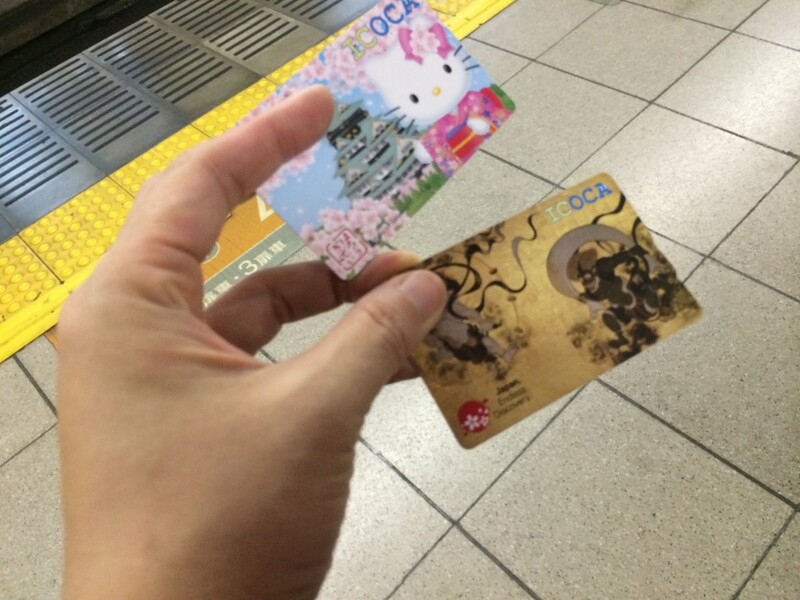 Actually,we were lured by a fare sale to Osaka. But we both had good food in our mind, as our non-negotiable on this trip and Kyoto proved to be the perfect setting for two food-loving lifelong best friends (We’ve been friends since were 8 years old). Kyoto offers much to do, to see, and to eat, plus it’s easy to get around with efficient trains and buses. Yes, most people opt to go to Japan in time for Sakura in spring, or to see the leaves in autumn. We were there on July 27 to 31, right smack at the height of their summer. Yes, we were hot and sweaty, but it was manageable. Many Japanese held fans to cool themselves. While we had food in our mind, we still wanted to see the sights in Kyoto. 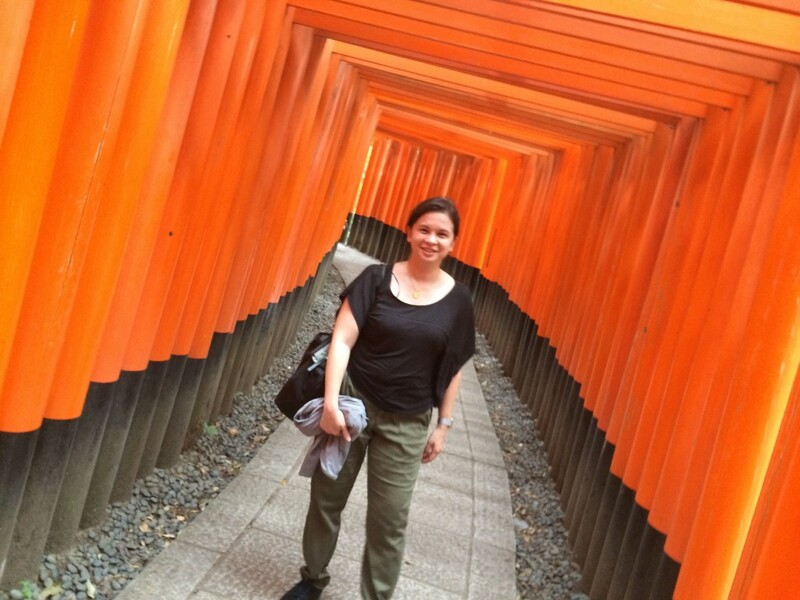 Rissa had been to Kyoto before, but she had a small toddler in tow making it difficult to freely explore then. On the first night, we went Geisha spotting in Gion. Kyoto’s Gion district is known for entertainment and geishas. Ponto-cho is a lovely narrow alley with traditional wooden buildings, now home to restaurants frequented by tourists. After getting lost in Gion searching for a Yakitori restaurant, we discovered the best spot to see geishas – Hanami-Koji. The street is lined with 17th century restaurants and teahouses, often booked for Geisha entertainment. At Sakura time, head to Shimbashi, said to be Kyoto’s most beautiful street. Rissa and I loved Gion not just for the Geishas but also to eat and stroll. 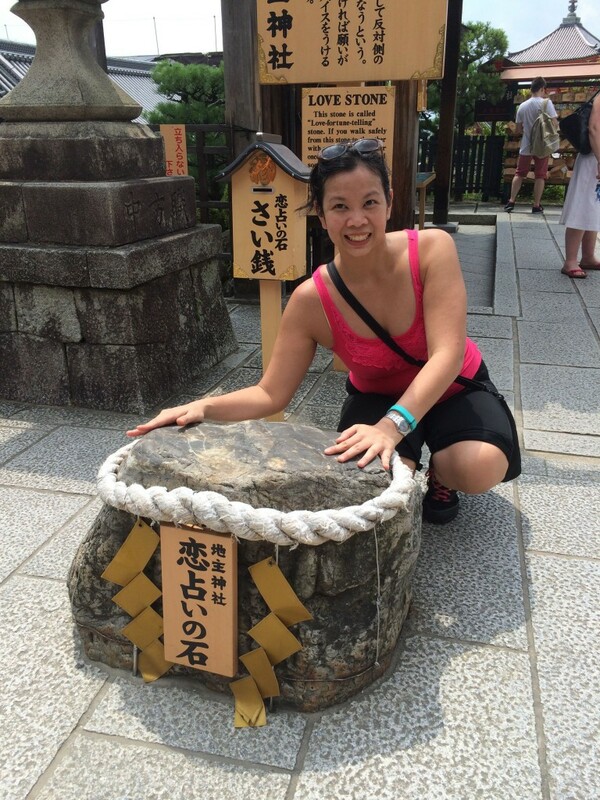 Read my post on Getting lost in Gion for more. 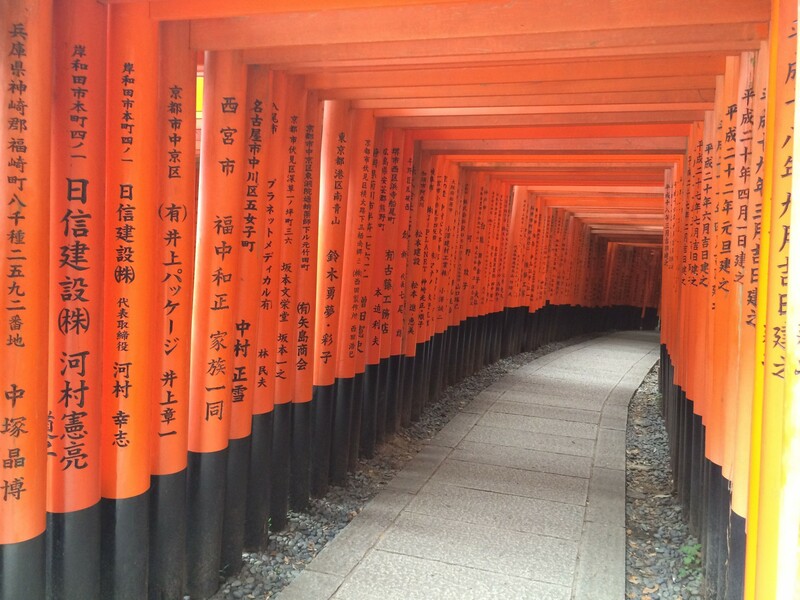 On my birthday, we set out to conquer Fushimi Inari-Taisha. 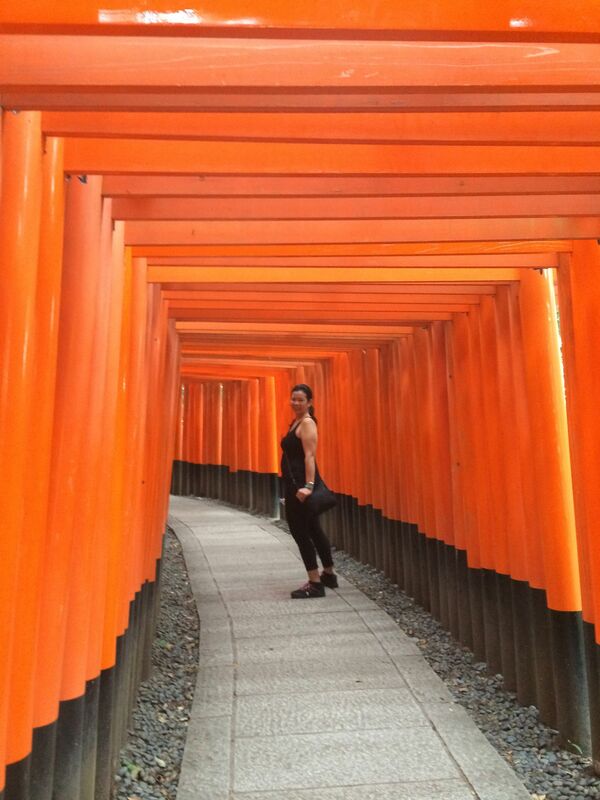 From the first time I saw a photo of orange Torii (Shinto Shrine gates), I knew I had to one day visit that place. So we did. 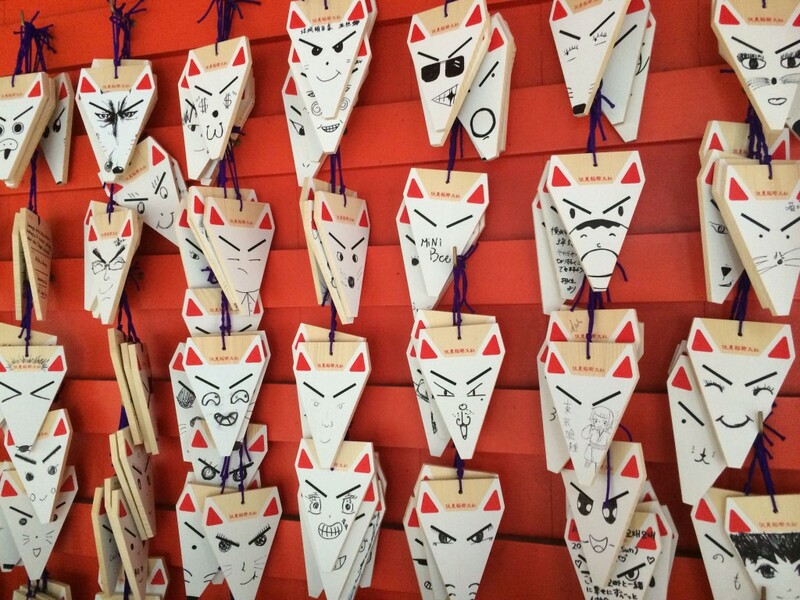 This is the head shrine of Inari (the god of rice and now the patron of merchants and businessmen). 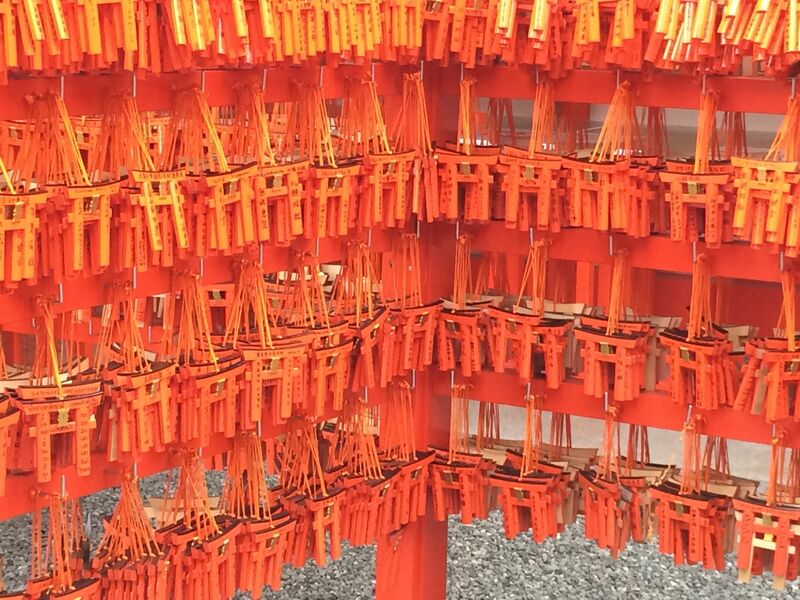 Each Torii is donated by a Japanese business. Shallow as it may seem, all I wanted was to be surrounded by the orange arches. I even planned to wear black so it would nicely contrast with the bright orange color. Little did I know, the torii pathway leads up to the mountain’s summit. 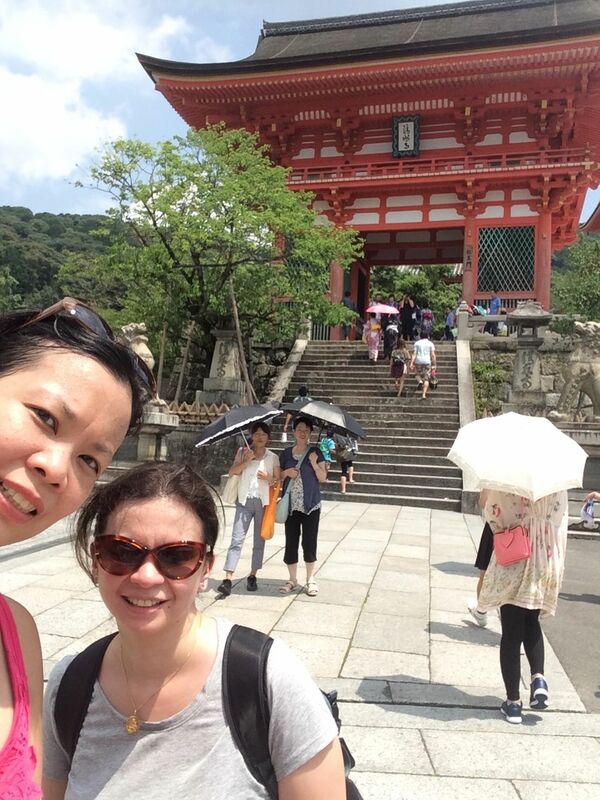 After a few photos, Rissa suggested,”Let’s head all the way to the top.” I had no idea it was a 4km pathway, taking two hours up to reach the peak of the shrine. I said, “Sure, I think we should because we can. We’re forty and we’re fit and healthy!” So step-by-step we made our way. Walking with us were other tourists, one even had her suitcase with her. When we got tired we took breaks and talked some more. 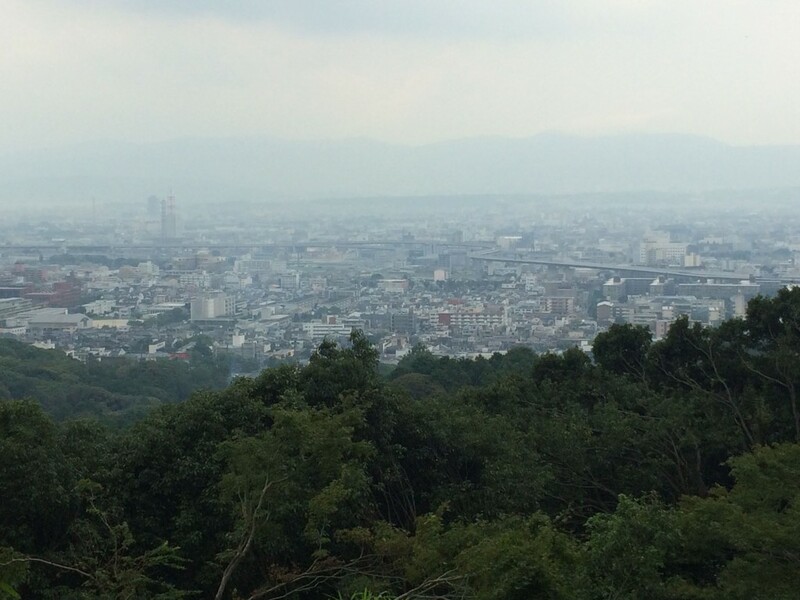 The view of Kyoto about midway to the summit at Fushimi Inari-Taisha. A good time to stop and rest! On the way down, we encountered this man. 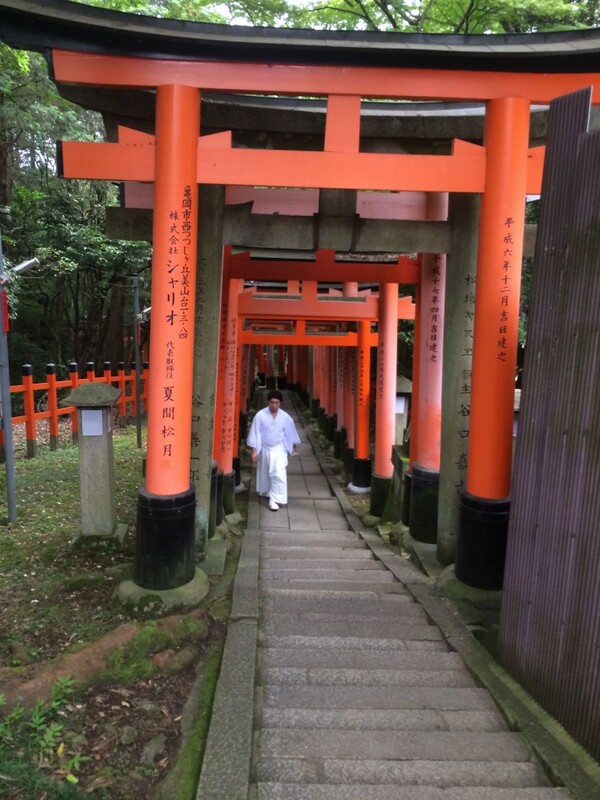 It was a magical image in an all white kimono… amidst the Torii. Soaking in sweat and tired, I wondered if we would make it to the top. We egged each other on and eventually we did. On the way down, I asked Rissa her bucket list and goals in life. It kept us entertained until the rain poured. We took shelter and waited for the rain to subside, next to a young Japanese couple. 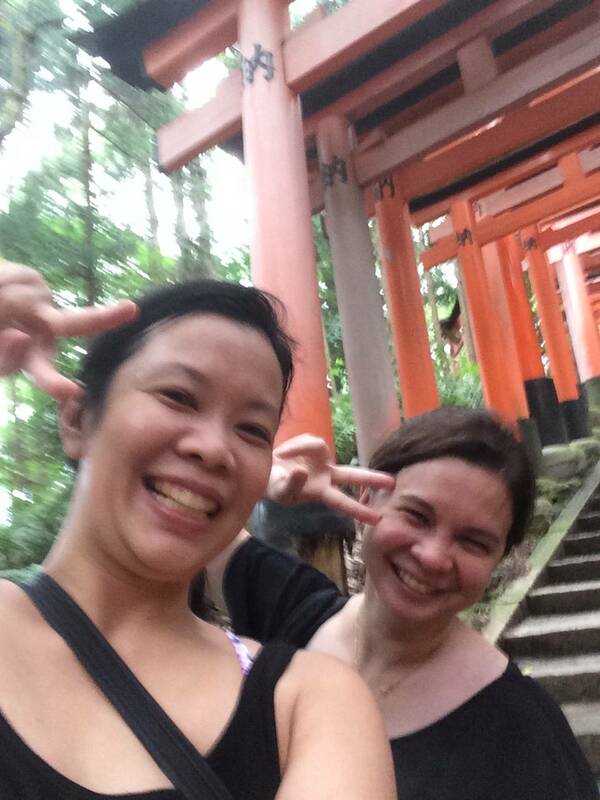 I told Rissa, “You know I couldn’t imagine doing this adventure with anyone else.” She smiled and nodded saying, “Me too!” We walked home in the rain, with aching legs, but very much satisfied we conquered Fushimi Inari. For the next two days though, we felt the burn in our legs and knees. 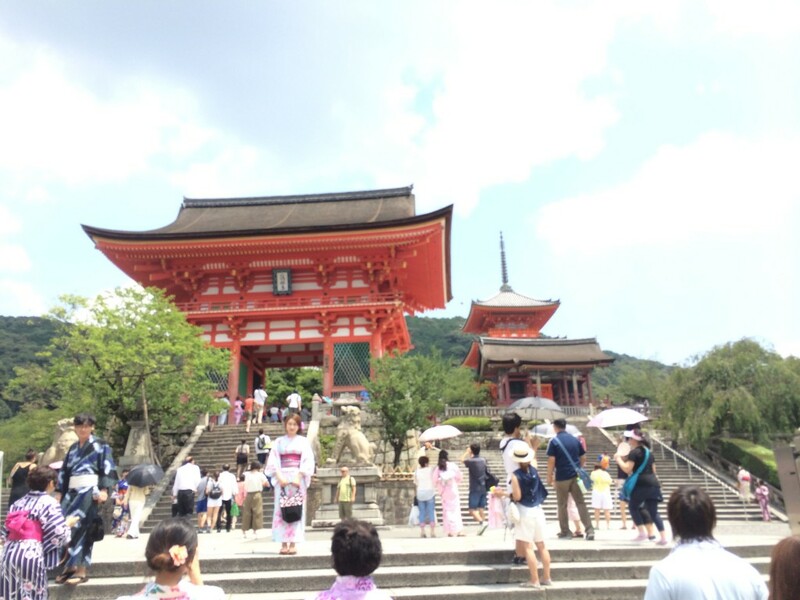 The next day, we went to Kiyomizu-dera. At first, we ambitiously thought we would tackle what the Lonely Planet guidebook called the Southern Higashiyama Walking Tour. But as the hot summer sun hit us, we realized this 5km, said to be lasting four hours was not a good idea. 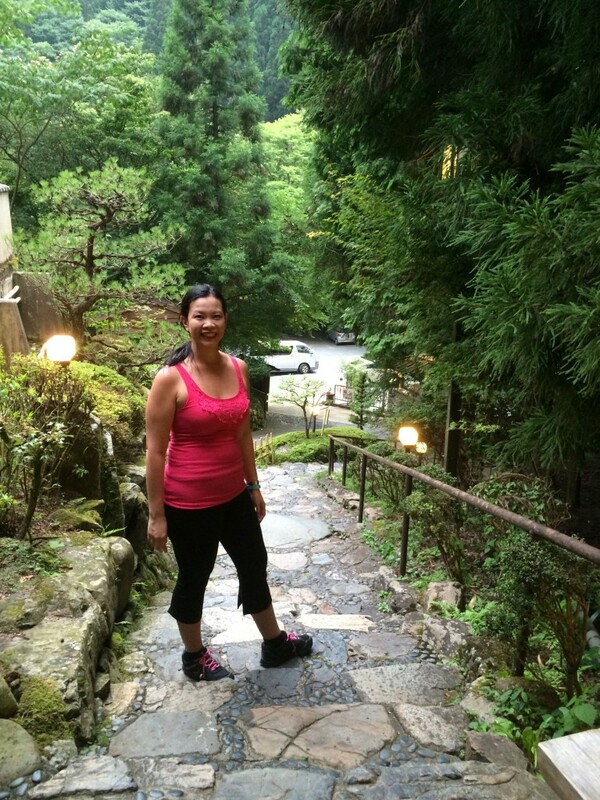 Walking up to the top of Chawan-zaka where Kiyomizu-dera was located, we promised each other an ice-cold green tea dessert as reward. The road to this Buddhist temple was steep. 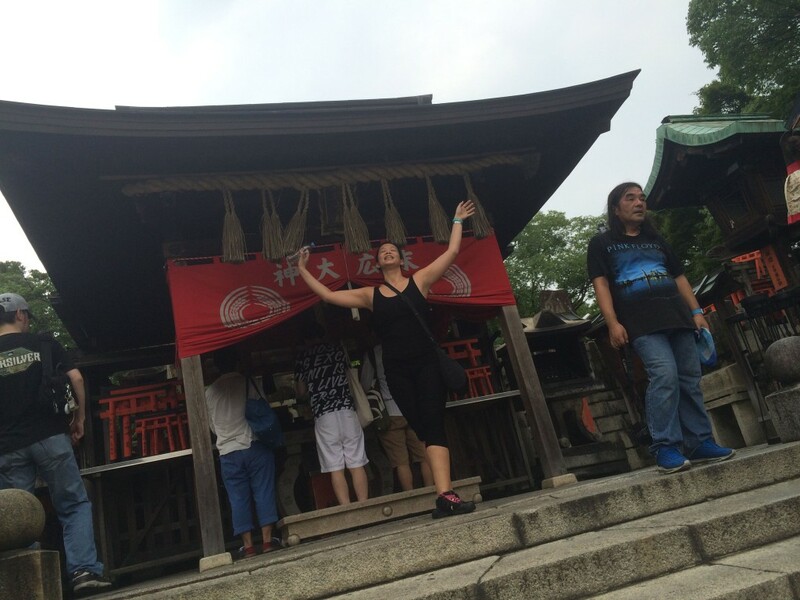 Expect heaps of tourists with many women dressed in kimonos and one hand holding a selfie stick. 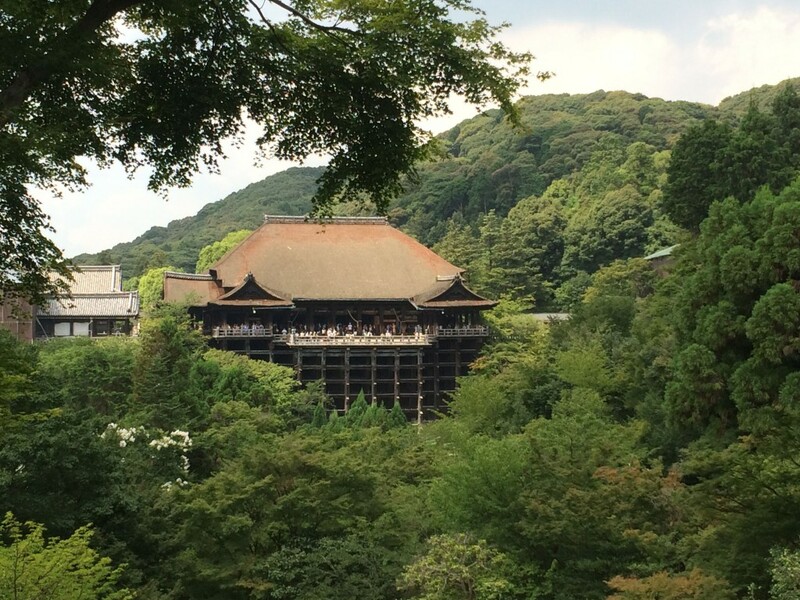 The temple is part of the UNESCO World Heritage Site list and is one of Japan’s national treasures. There are a lot of opportunities here to make wishes. 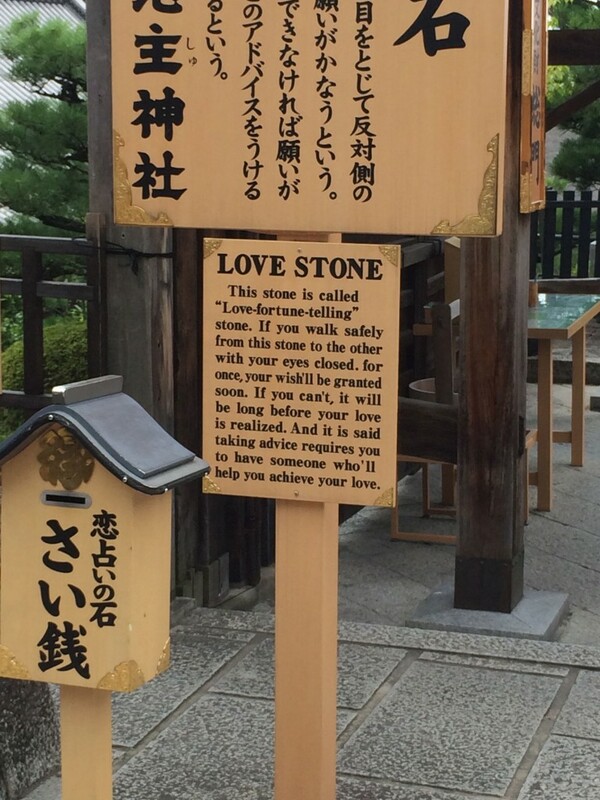 A few steps above the main hall, you will find the love stones. Visitors who want success in love close their eyes and walk between two stones. If you miss the stone, you will not find love. You may ask for help to guide you to the stone, but expect to require assistance in finding your true love. Rissa took a video of me doing this. Fearing I would bump into other tourists, I kept asking her if I was near. She did not answer definitively. All she said was “Keep going, Maida!” I did find the stone, and yes, hopefully love will find me. This little activity captured Rissa and I have been pushing each other through our challenges and difficulties in real life. After getting our Matcha dessert reward at Kasiga-ya Teahouse, we decided to do something unique to Japan. We both have never been to an Onsen, a natural hot spring bath. The thought of an onsen also enticed our hot and tired bodies. 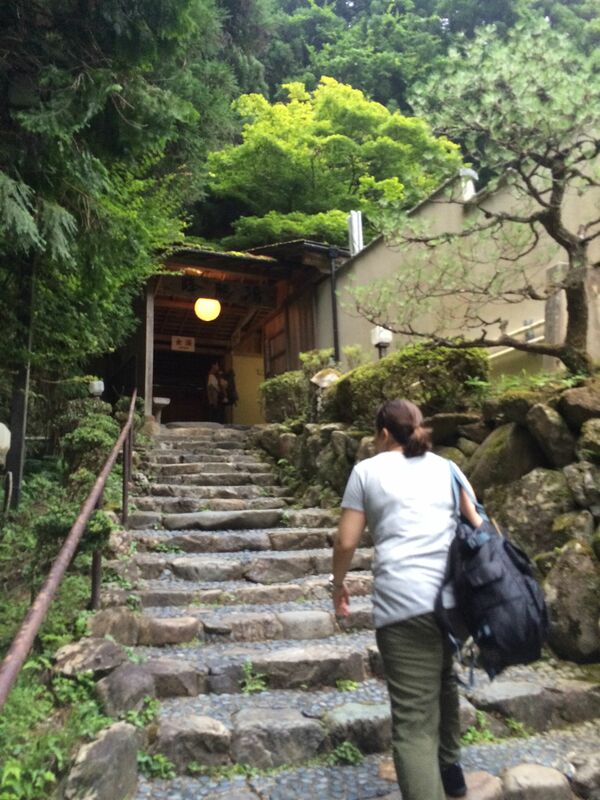 An hour away from Kyoto by train, we headed to Kurama Onsen. They offer both outdoor and indoor baths. We opted for the outdoor bath, costing 1000 yen. Onsen etiquette does not allow people with tattoos to bathe. They also require everyone to bathe naked. Before we joined the international group of women in the outdoor bath, Rissa and I realized we would be baring our naked selves to each other. But, it didn’t matter at this point. When it is your best friend, there is no shame in going naked. After all, she knows my secrets, and I know hers. Beneath the towering trees, we soaked in the hot spring water. Our achy joints finally relaxed. 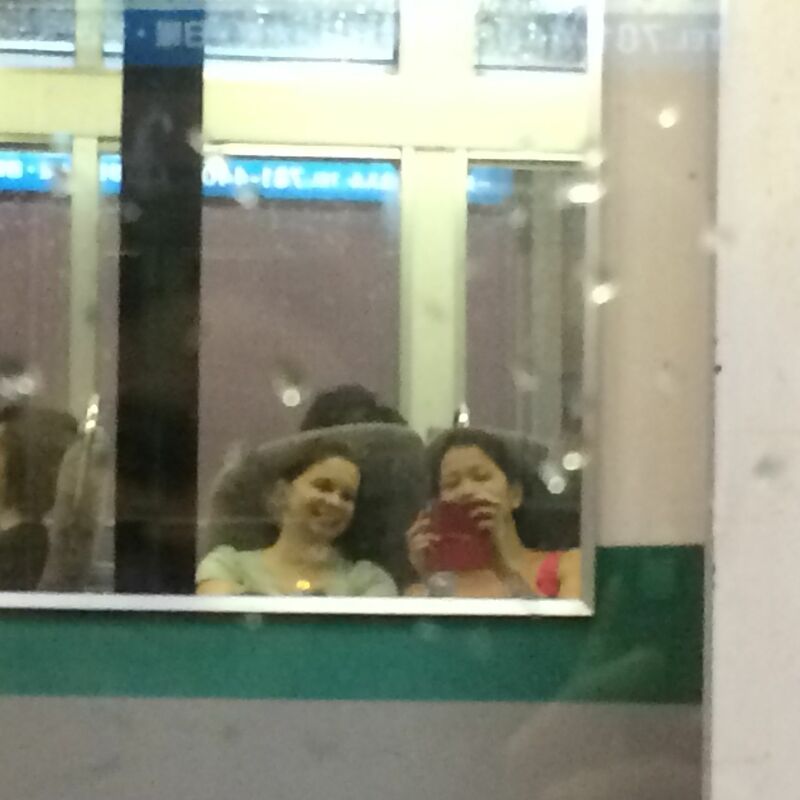 Seeing our reflection in the mirror at one of the train stops! At the end of our BFF40 holiday, we did not want to leave Kyoto. We were smitten by its beauty, enchanted by its food, entertained by the vendo machines, and captivated by the kindness of its people. But we also knew we would be bringing home new memories and a now fortified friendship. I will be in Japan in less than 20 days. OMG I cant wait. 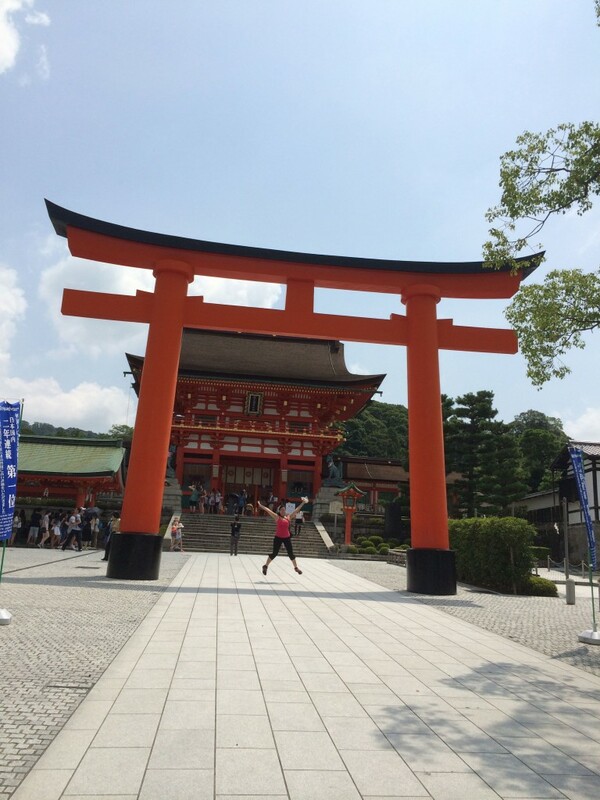 In Kyoto for 5. Thank you for getting me MORE exceitd about my trip. Great photos and very useful info!